Amazing versatility and trusted dependability meet incredible speed. Versatile, fast and dependable, the BarraCuda Pro drives are the latest generation of an ultra-reliable product family spanning 30 years. Plus, you can take advantage of the standard 2-year Rescue Data Recovery Plan(visit official website/customer care for more information). 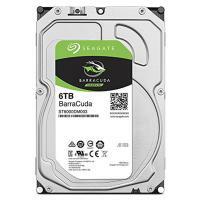 BarraCuda Pro leads the PC compute market with the largest storage options available—up to 14TB. Store more games, movies and music than ever before. 7200-RPM spindle speeds, up to 256MB cache, and the SATA 6Gb/s interface deliver up to 250MB/s maximum sustained transfer rate. Lowest power management for 3.5-inch performance desktop drives, as low as (6.8W). Confidently lean on your BarraCuda Pro 24×7. With a 300TB/year workload rate limit reliability is a given. Creative pros and performance users alike can enjoy peace of mind when protecting their data. With BarraCuda Pro, you can have additional confidence with a Rescue Data Recovery Plan, just in case of unexpected data loss. Terms and conditions apply; may not be available in all countries.